Today we share how to replace a broken tile on a shower wall. Sometimes this happens while installing tiles…that’s life. In this example the tile was set over Wedi backer boards. Which made removing and resetting the tile easy. Use a hammer and bust up the tile. Then remove the rest of the tile with a hammer and chisel. If a tile is set correctly it will pull off the waterproofing on the backer board. That’s exactly what happened to us- which isn’t a big deal with Wedi since the foam is waterproof. Remove thin-set residue using a rasp accessory attached to an oscillating multi-tool, e.g. FEIN Multimaster. Check the backer board for damage and waterproof if necessary. Had the blue foam been compromised a layer of Wedi joint sealant could re-waterproof it. Apply thin-set mortar to the backer board and back of the tile. Then re-set the tile on the shower wall. Horseshoe shims come in handy and help keep the grout joints evenly spaced. 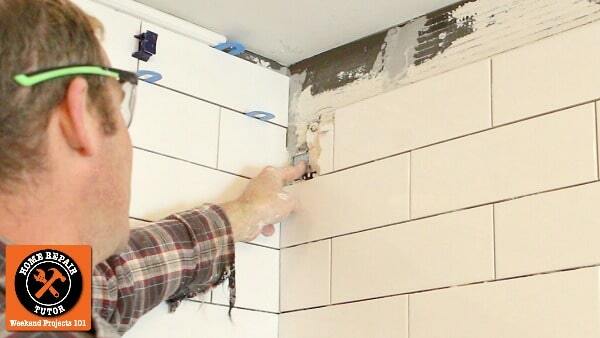 Our video has the details on how to replace a broken tile and do it fast! Wedi is a great backer board because the foam is waterproof. We built this entire shower using Wedi’s Fundo Primo shower system. Thanks as always for reading, watching, and being part of our awesome community. Ask your questions below and we’d be happy to help. P.S. Save time researching a bathroom remodel and join Bathroom Repair Tutor. 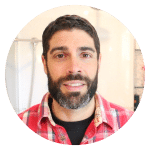 You’ll learn how to plan and remodel a bathroom while saving money and adding value to your home! Our shower looks like mortar or cement was used to pit up tile. What can we use to replace tile on this type of wall? For that I’d recommend applying two coats of RedGard to the substrate. Tape off the adjacent tiles then apply one coat of RedGard. Let it dry and apply the second coat. Then set the new tile using thin-set mortar, use Versabond or another Custom Building Products mortar since they make RedGard.